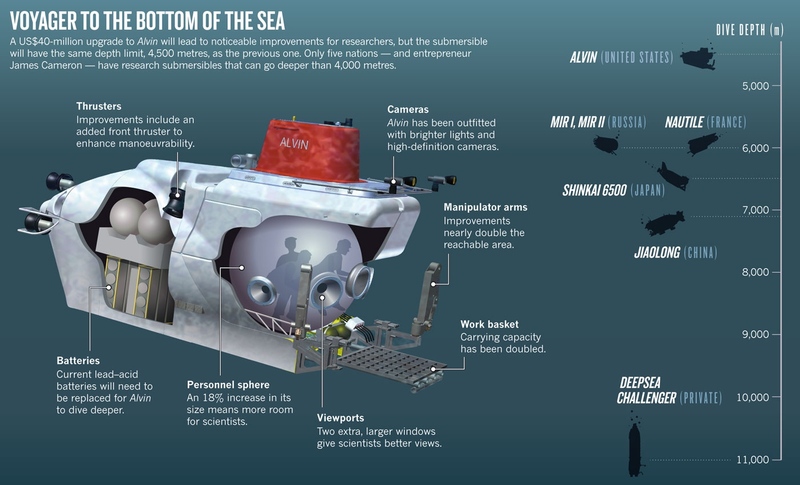 Nature has a great article on the nearly completed updates to the deep sea submersible Alvin. These upgrades, performed at WHOI (Wood's Hole Oceanographic Institution- pronounced hoo-e) will hopefully help American researcher at multiple institutions keep pace with the international science community in deep sea exploration. But, probably not. The majority of the article is about America's lagging research in the deep-sea because of smashed budgets and limited resources. Check out the awesome web of scientists and marine laboratories involved in working on Alvin, and see how deep sea science has been hobbled by economic cuts.